It is cold, the clock is ticking towards midnight, and we are standing on a frozen lake in the middle of nowhere in a remote valley outside of Tromso city in Northern Norway chasing the Northern Lights. It is so cold that the snow squeaks under our feet as we walk, and when we breathe out it looks as if we are smoking – the temperature has just dropped to a rather chilly minus seventeen degrees Celsius (1 degree Fahrenheit). We are far away from the city with its lights and houses, surrounded by complete darkness — no lights except the faint glow from the camera screen. I have seldom felt this close to nature before, excited and hopeful…..will the Northern Lights show up this evening?! And yes, it does to its fullest! 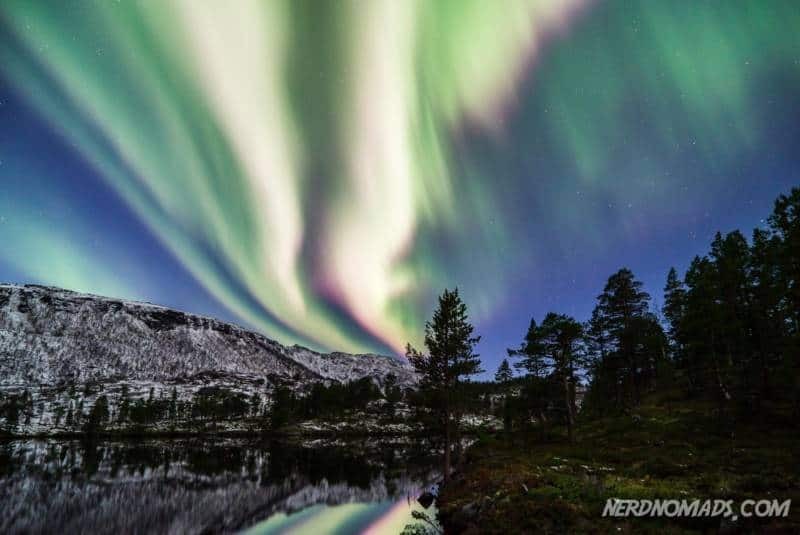 We are lucky this evening and get to witness nature’s amazing fireworks – the magical Northern Lights in all its colors. ? 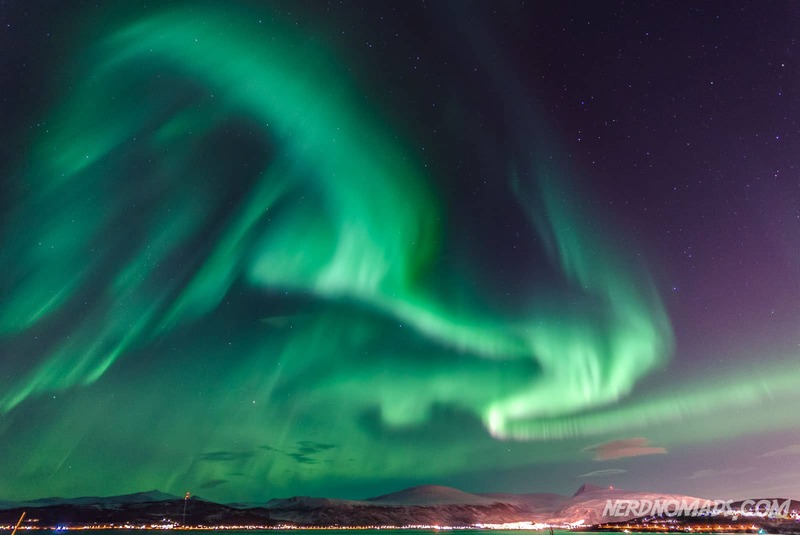 Northern Lights in Tromso – Nature´s spectacular firework! If you are thinking of heading to Tromso, then you should also check out our Tromso guide with tips on what to see, do and eat. Tromso has a lot of accommodation options. 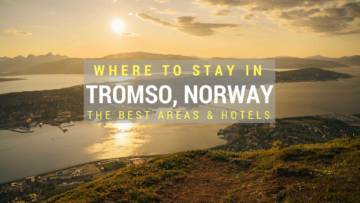 If you haven’t yet decided on where to stay in Tromso, then click here to read our complete guide to our favorite Tromso areas and hotels. 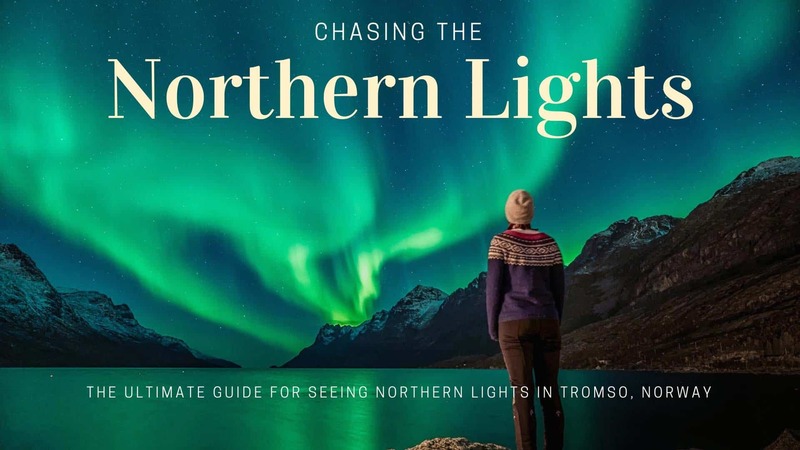 Here is everything you need to know to have the ultimate experience of chasing Northern Lights in Tromso Norway, including the best Northern Lights tours in Tromso, and the best place to see Northern Lights in Tromso. 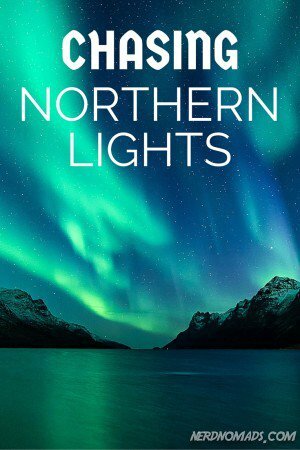 I recommend that you join a Northern Lights Tour, especially if you are in Tromso only a few days and are short on time, if the weather is not that good with a cloudy sky, or you don´t have a car or plan on renting a car. 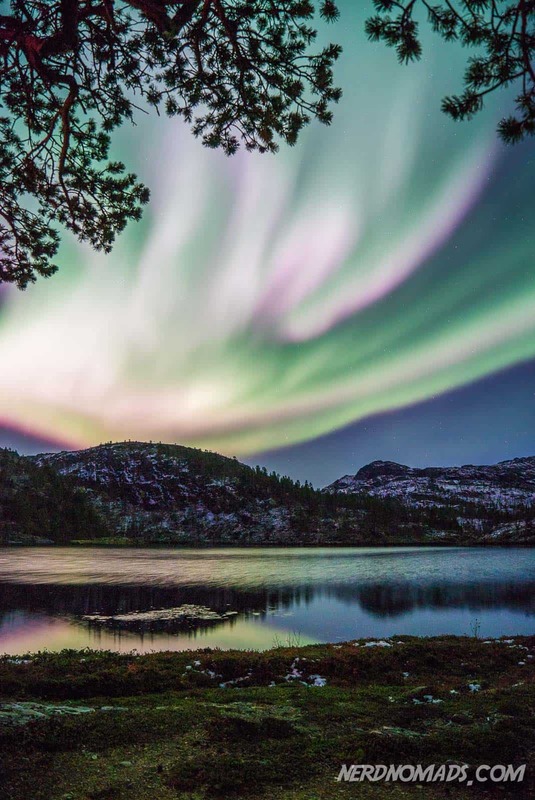 The Northern Lights tour guides are highly skilled and experienced in reading the weather forecast and Northern Lights forecast, and will find the best areas where it is most likely that the Northern Lights will appear. They really haunt and chase the Northern Lights and will drive you all over Northern Norway and sometimes across the border to Finland and Sweden to show you to the Northern Lights. So joining a Northern Lights Tour will increase your chances of seeing the Northern Lights. There are a lot of Northern Lights Tour to choose from in Tromso and Northern Norway in general, so it can be a bit difficult to decide the right one. What tour is best for you, depends on how you want to see the Northern Lights and what kind of activity you want to do while viewing it. This small-group tour takes you to the mountains, fjords, and valleys outside of Tromso in the chase for Northern Lights. The actual tour depends on the weather and the Northern Lights forecast as they will drive you to the area that has the highest chance of seeing the dancing lights. Sometimes they even drive to Northern Finland or Sweden to find the Northern Lights! On this tour, you get a meal, hot coffee, and tea, and you get to borrow warm, comfortable thermal suits, warm winter boots, and a tripod for your camera or mobile phone if you don´t have one yourself. Wherever they find the perfect spot for watching the Northern Lights, the guides will lit a cozy bonfire for you to sit around. A lovely and warm gesture! They will pick you up and drop you off at Radisson Blu Hotel in the center of Tromso before and after the tour. If you aim to take great shots of the Northern Lights, this Northern Lights Photography Tour is for you! Here you will get help and guidance by professional photographers to take excellent photos of the Northern Lights. They will drive you to the best and most stunning places to photograph the Northern Lights, surrounded by mountains, lakes, and fjords. On this tour, you also get snacks and hot drinks, as well as borrow a warm and comfortable thermal suit. Your guides will also take Northern Lights shots during the trip, which you get a copy of after the tour. If you want to learn how to take the best photos of the Northern Lights, you should join this 2-hours indoor Northern Lights Photography Workshop before going on a Northern Lights Tour or heading out on your own to capture it. 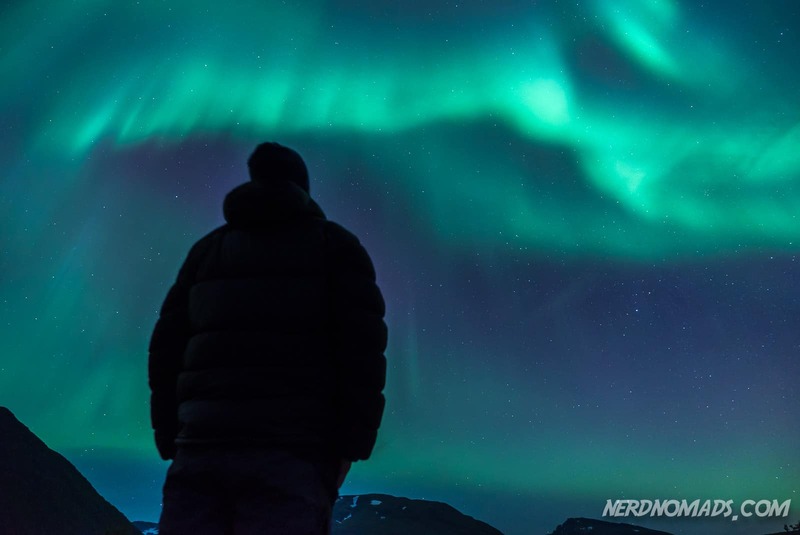 You will learn everything you need to know to take photos of the Northern Lights, everything from the theory, the settings on your camera, as well as tips and tricks, to take the perfect Northern Lights photo. If you like dogs and want to try out dog sledding, this tour where you get to combine dog sledding with watching the Northern Lights is perfect! Dog sledding is great fun! Nothing beats experiencing the beautiful nature of Tromso getting pulled by huskies where you get an excellent view of mountains and fjords while the Northern Lights is dancing above your head. It is breathtaking and something you will never forget. A bus will pick you up at 18:15 (6:15 pm) at the Radisson Blu Hotel in downtown Tromso and drive you to Tromso Wilderness Center where they have a camp of 300 friendly huskies. Once you get to the Husky camp, you get to put on a warm and comfortable thermal suit and some warm winter shoes. You will not be cold. 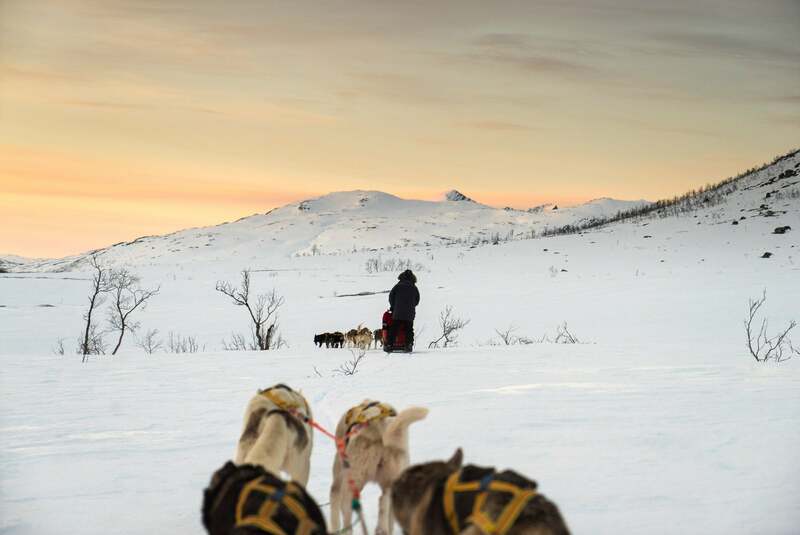 Then it´s off to a one-hour thrilling dog sledding ride through mountains and fjords where you will hopefully get to see lots and lots of Northern Lights. Us on a dog sledding day tour in Tromso, so it was too light to see any Northern Lights. Dog sledding is great fun! After the dog sledding, you get to cuddle with the furry and friendly huskies. The husky pups are soooo cute! ♥ Then it´s time for something to eat, and you go inside a big warm Lavvo (Sami inspired tent) where you get to sit around a campfire and have a hot meal of Bacalao (stockfish in tomato sauce, vegetarian options as well). The total time of this dog sledding tour is approximately four hours (including transport and eating). If you dream of meeting real and friendly reindeer where you get to feed them, cuddle, and go reindeer sledding, then you have to dream no more. Then this is the tour for you! It is a once in a lifetime experience, and if you are lucky, you even get to see some dancing Northern Lights while cuddling or sledding with the reindeer. A great combination! They will pick you up at the Scandic Ishavshotel in downtown Tromso at 18:45 and you are back around midnight. At the reindeer camp, you will also be served a traditional Sami meal called Bidos (a reindeer meat soup), or you can choose a fish soup or vegetable soup, and sit inside a Lavvo (Sami tent) around a warm and cozy bonfire. You will also meet and learn about the Sami people, the indigenous people of Norway, Sweden, Finland, and Russia. The Sami guide will tell you about their culture of herding reindeers and will perform a Joik, an extraordinary traditional Sami folk song. It is a terrific experience! This tour combines a fjord cruise with watching Northern Lights, can it be more perfect? On this tour, you will sail through the beautiful fjord and mountain landscape that surrounds Tromso on a luxurious catamaran sailboat. 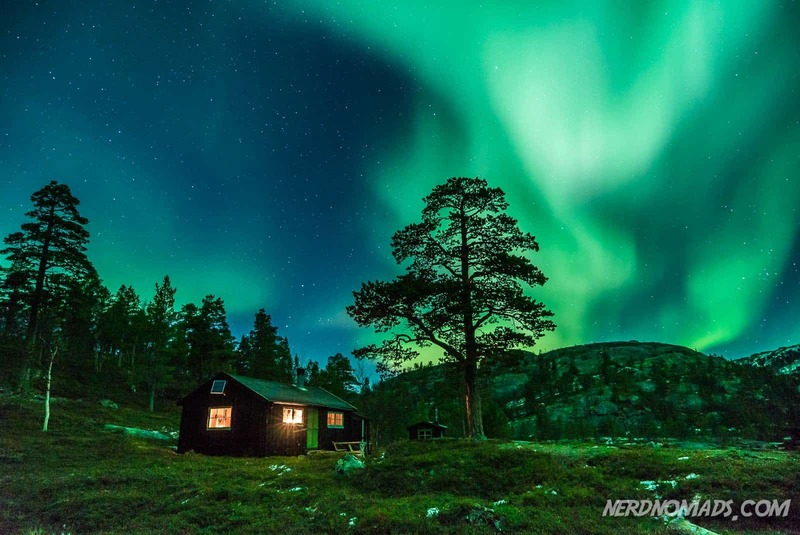 You get so sin inside the warm and cozy boat and watch the Northern Lights flashing over the sky outside, or you can walk onto the deck outside to see it even better. The catamaran sailboat is anchored right by the Scandic Ishavshotel in downtown Tromso. The fjord trip takes about three to four hours, and along the way, you will be served hot drinks and snacks. The experienced guide and skipper will tell you all about the Northern Lights and the fjords and mountain landscape that you sail through. You get to wear warm and comfortable safety suits and can sit outside or inside and watch the Northern Lights and the beautiful Arctic nature. If you are seeking a real Arctic adventure where you get to experience the Arctic wilderness, then you should join this snowshoeing tour. A snowshoeing hike is one of the best ways to experience the stunning mountain and fjord landscape of Tromso and see the Northern Lights at a dark and remote area. It is an unforgettable wilderness experience! Here you get to go on a snowshoeing hiking trip through the beautiful mountain and fjord landscape of Tromso, and at the same time get some exercise. 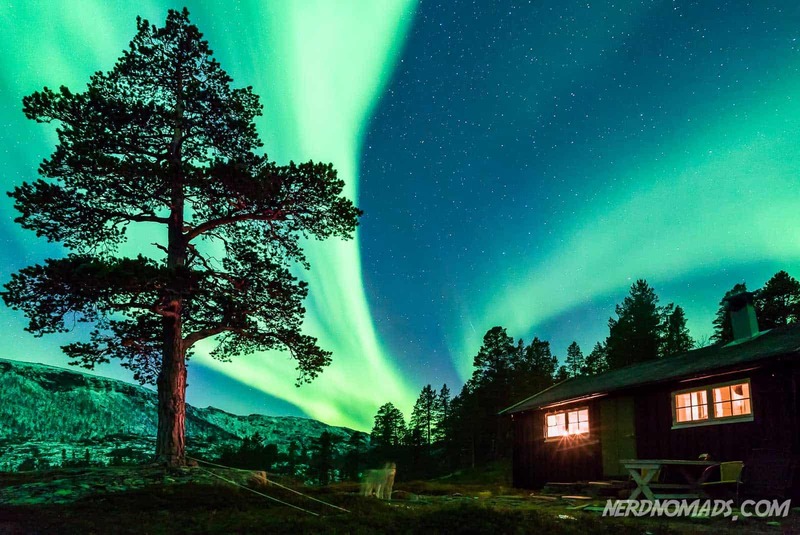 The whole tour takes about six hours, including the snowshoe hiking trip, and a delicious traditional Norwegian dinner (including dessert, coffee, and tea) inside a cozy and warm traditional Norwegian cabin. You are provided with everything you need on this trip – snowshoes, poles, and a headlamp. You get picked up at Clarion Hotel The Edge at 18:00 (6 pm) by a friendly guide that will drive you to place to go snowshoe hiking to the cabin. If you have a need for speed and want to watch the Northern Lights at the same time, then a snowmobile tour is the one for you! On this tour, you will go on a fun and thrilling snowmobile adventure trip through the valley Tamokdalen right outside of Tromso city (a 75-min drive from Tromso). The valley Tamokdalen is inland, and here the chances are high of getting a clear sky and some spectacular Northern Lights. Here the weather is drier and more stable than at in Tromso which is at the coast. Plus here there are hardly any houses or artificial lightning making this the perfect place to watch the Northern Lights! This evening snowmobile tour includes transport from and back to Tromso by bus, where the bus ride in itself is a guided sightseeing trip of the beautiful Tromso area. They will pick you up at the Scandic Ishavshotel in downtown Tromso at 16:45 (4:45 pm), and you will be back at Scandic Ishavshotel at 23:45 (11:45 pm). You don´t have to know anything about snowmobiles or how to ride a snowmobile to join this tour. Your friendly and welcoming English speaking snowmobile guide will teach you everything you need to know to safely ride a snowmobile. Included in this tour is also a delicious hot meal, warm and comfortable insulated bodysuits, winter boots, gloves, headwear, and a headlamp. If you like some speed and action and want to see unspoiled wilderness of mountains, fjord, and valleys topped with spectacular Northern Lights, then you will have the time of your life on this tour! The Northern Lights, also called Aurora Borealis, can only be seen in the northern hemisphere and is strongest above the Arctic Circle (60-degree latitude) like in Northern Norway and Tromso where we live. 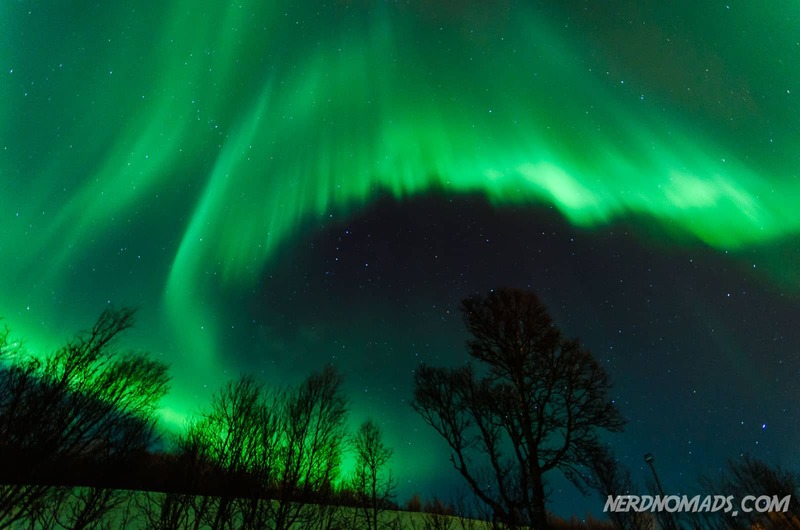 Northern Lights can move incredibly fast, almost like it`s dancing! Is this an alien?! 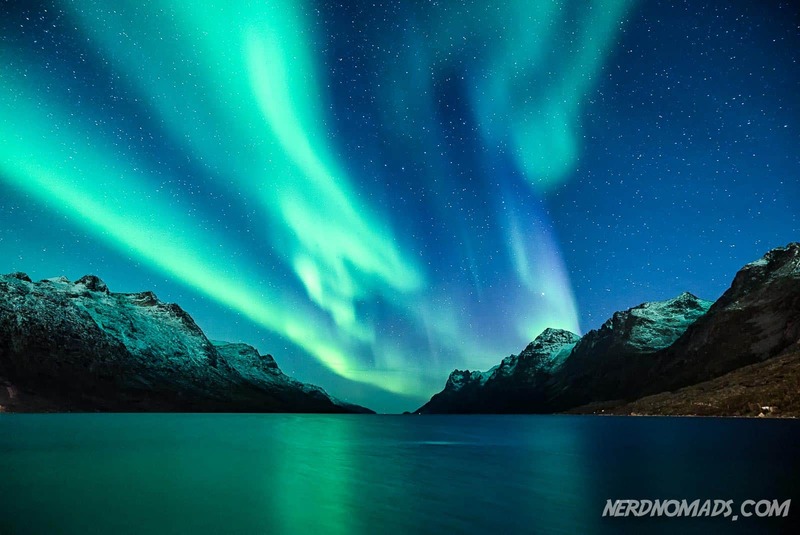 It was named Aurora Borealis by Galileo as far back as 1619 after Aurora – the Roman goddess of dawn, and Boreas – the Greek name for the north wind. The Northern Lights occur when solar wind packed with charged particles come into Earths magnetosphere. The charged particles, mainly electrons, and protons get precipitated into the upper atmosphere where their energy is lost causing emitting of colored lights. This emitted light is what we see down at Earth as Northern Lights. The Northern Lights often appears as a diffuse glow in the sky or as “curtains” in the east-west direction, being shaped by Earth’s magnetic field. Most of the Northern Lights is produced between 90 and 150 km above the ground, and reach out to more than 1000 km. Red – The red color of the Northern Lights comes from atomic oxygen that emits at 630 nanometers (red) at the highest altitudes. Red is not so common as green, as our eyes can`t see red very well unless there is intense solar activity. Green – Green is the most common color of the Northern Light. When molecular nitrogen collides with an oxygen atom, energy is transferred, which radiates it away at the green wavelength (557,7 nm). Blue – At even lower altitudes molecular nitrogen and ionized molecular nitrogen creates visible light emission in the form of red and blue (428 nanometers). Blue and purple only shows up at the highest levels of solar activity and is not as common as green. Ultraviolet and infrared – Ultraviolet and infrared lights are also part of many Northern Lights. Ultraviolet auroras have also been seen on Mars, Jupiter, and Saturn. Yellow and pink – Shades of yellow and pink are can also appear in the Northern Lights. These are a mix of red and green or blue. Other shades of red, as well as orange, may be seen on rare occasions. Yellow/ greenish is most common. To see the Northern Lights, you have to head up north above the Arctic Circle and 60 degrees at least. Tromso in Northern Norway is one of the best places in the world to see the Northern Lights, located at latitude 69,6 degrees north. Tromso is located in the middle of the Northern Lights Oval – the area with the highest probability of seeing the Northern Lights. 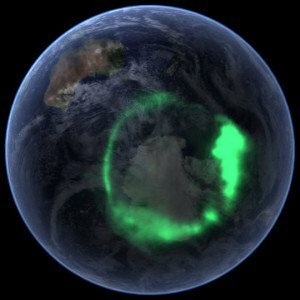 The Northern Lights Oval is centered around 65 degrees North, and its width is about 10 degrees but expands when the solar activity is intense. 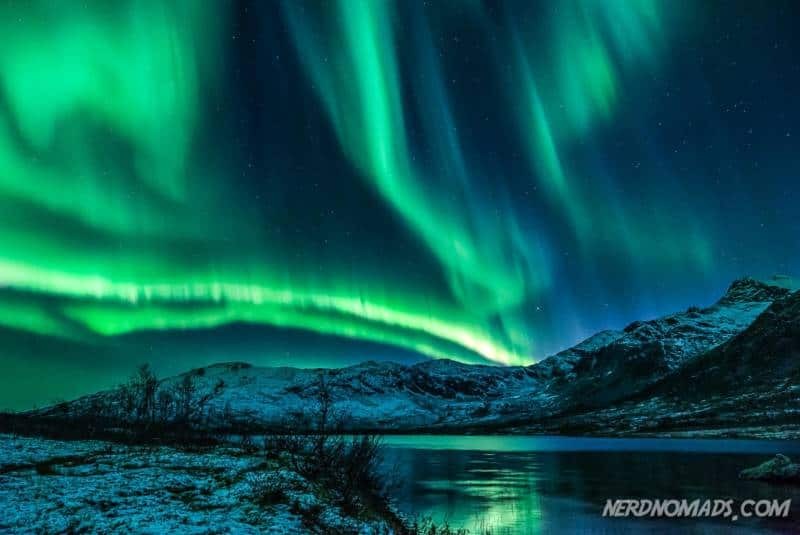 Northern Norway, Sweden, and Finland, Siberia, Alaska, northern Canada, Greenland, and Iceland are the only places in the world where you can see Northern Lights. Many of these places are however too remote and uninhabited, and impossible or very difficult to visit. Tromso is perfect to go to for chasing Northern Lights, as it is a big city (biggest in Northern Norway at least with 70 000 inhabitants), with plenty of things to do besides seeing Northern Lights. You can, for instance, go dog sledding, kayaking, visit museums, mountain hikes, skiing, reindeer sledding, fishing, sailing, and whale safari. Tromso is easy to get to by air. SAS and Norwegian have more than 15 flights from Oslo to Tromso each day. Tromso is also quite mild when it comes to temperature due to the Gulf Stream. Tromso Airport is only a ten minutes drive from the city center. Tromso has plenty of great hotels and other accommodation options to choose from, like Airbnb apartments and rooms. In Tromso, you can see Northern Lights from mid-September until mid-April. The best time to see the Northern Lights is during the winter, from mid-November to mid-January as during these months the sun does not rise above the horizon at all and it is entirely dark. This is called the Polar Night and is the perfect period to watch the Northern Lights. Northern Lights appear in the evenings, often between 19 and 2 o`clock at night (between 7 pm and 2 am). But you never know for sure when or where it will show up, which makes the Northern Light hunting even more exciting. When you finally see it, you feel blessed and privileged and treasure it even more. Since the Northern Lights occur when solar wind hits the Earth`s atmosphere, there are periods and years when the Northern Lights are more likely to appear. Massive geomagnetic storms are most common during the peak of the eleven-year sunspot cycle or during the three years after the peak. Being out watching the Northern Lights can be a cold experience if you don`t have the right clothes and shoes. Here is a complete packing list of what to bring for a trip to the Arctic to chase Northern Lights. In order to see the Northern Lights in its full glory and at its strongest, you have to head out of town to more remote areas with as little artificial lighting as possible. Darkness is your friend when it comes to admiring the Northern Lights. The sky has to be clear and not covered with clouds. The darker it is, the better, so full moon is not usually the best. I recommend that you rent a car in Tromso so that you can get to the best place to see Northern Lights in Tromso. There are very few buses that take you out of the city to the remote areas. You should drive out of the city to for instance Kvaloya (Whale Island) which is connected to Tromso city by a bridge. Renting a car is best and most convenient if you want to see the Northern Lights on your own on a DIY Northern Lights trip without joining a Northern Lights Tour. Located at Kattfjordeidet on Kvaloya/ Whale Island this beautiful freshwater lake is surrounded by tall peaky mountains. This area is by us locals called the “Chamonix” of the Arctic, named after the famous and stunning mountain area in the French Alps, and is very popular among mountain skiers and hikers. The landscape here is wild and spectacular and my favorite in Tromso. On your way to Kattfjordvatnet, or on your way back to Tromso city, you should stop by the favorite cafe and grocery store Eide Handel, Eide Handel is a big grocery store/ local supermarket with a great cafe that sells local goods, snacks, and souvenirs. Eide Handel is open until 23:00 (11 pm) each weekday, and until 22:00 (10 pm) on Saturdays. It is closed on Sundays. Click here (Google Maps) for the driving route from Tromso center to Kattfjordvatnet (a 30 minutes drive). Ersfjord is a beautiful and peaceful fjord on Kvaloya/ Whale Island. The fjord is quite narrow, surrounded by spectacular mountains on each side which makes it a lovely and favorite place to take Northern Lights photos. While you are in Ersfjord, I recommend that you visit the lovely and cozy cafe Bryggejentene. Try their delicious home-made cakes together with a hot cup of tea, coffee, or hot chocolate. Bryggejentene also sells clothes and other stuff. It is a great place to shop for gifts to bring back home. Opening hours of Bryggejentene cafe and shop: 11-16 (4 pm) on weekdays, 11-17 (5 pm) on Saturdays, closed on Sundays. Click here (Google Maps) for the driving route from Tromso center to Ersfjord (a 30 minutes drive). A big freshwater lake located in the valley Finnvikdalen on Kvaloya. At the top of the valley, you get a great view of the mountain and fjords. Click here (Google Maps) for the driving route from Tromso center to Finnvikvatnet (a 20 minutes drive). Snarby is a remote area on the mainland of Tromso with no houses, street lights or artificial lighting. Here you are surrounded by mountains, and you can look down on the Oldervik and on a clear day have a view of the Lyngen Alps. Click here (Google Maps) for the driving route from Tromso center to Snarby (a 40-50 minutes drive). 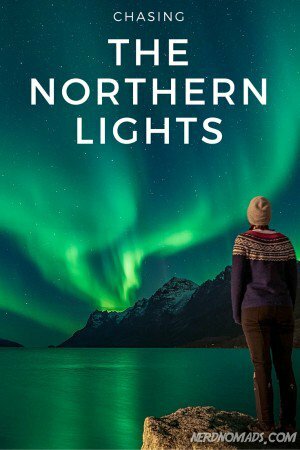 If you don´t want to rent a car, and you don´t want to join a Northern Lights Tour, there are some places close to downtown Tromso where you get a little bit away from the street lights so you can see the Northern Lights better. The fjord Kaldfjord on Kvaloya (Whale Island) – Take bus no. 42 to the last bus stop “Eidkjosen”, it is next to Kvaløy Church (a 20 min bus ride one way) and walk around the fjord Kaldfjord. See Google Maps for the bus driving route. Have a warm coffee, tea, or chocolate and something to eat at the cafe at Eide Handel in Kaldfjord (just next to the bus stop Kaldfjord). Eide Handel is a fantastic big grocery store/ local supermarket with a great cafe that sells local goods, snacks, and souvenirs. Eide Handel is open until 23:00 (11 pm) each weekday, and until 22:00 (10 pm) on Saturdays. It is closed on Sundays. The fjord Ersfjord on Kvaloya (Whale Island) – A beautiful fjord surrounded by steep mountains. Take bus no. 425 to Ersfjord (a 30 min bus ride one way, or take a taxi) and walk around the fjord Ersfjord. See Google Maps for the bus driving route. Stop by the lovely and cozy cafe Bryggejentene located in Ersfjord. Try their delicious carrot cake and chocolate brownie, together with a hot cup of tea, coffee, or hot chocolate. Bryggejentene also sells clothes and other stuff; it is a great place to shop for gifts to bring back home! Opening hours of Bryggejentene cafe and shop: 11-16 (4 pm) on weekdays, 11-17 (5 pm) on Saturdays, closed on Sundays. Bring your camera and tripod, warm clothes, something to eat and some hot coffee, tea or chocolate. Cross your fingers and hope that the Northern Lights will show up! 🙂 And the more days you have, the more likely you are to get lucky and see nature’s most spectacular light show. If the weather is bad, with a cloudy sky, it is not that easy to find the best areas for Northern Lights by yourself. You should check the weather forecast for different areas of Tromso and its surroundings and go to the area that has fewer clouds. If you are unlucky, however, and do not see the Northern Lights, there is always the next-best-thing – the spectacular Northern Lights movie “Experience the Aurora” at Nordnorsk Vitensenter. The film is awesome and is shown every day. A real must-see if you are visiting Tromso, even if you get to see the real thing or not. 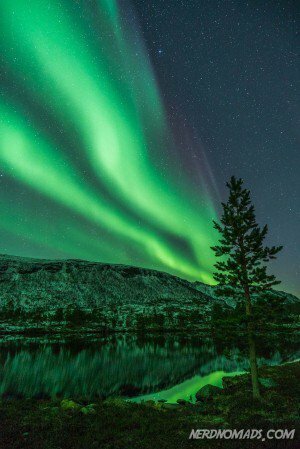 There you go, our top tips on what are the best Northern Lights tours in Tromso, and where are the best place to see Northern Lights in Tromso, both if you are renting a car or not. 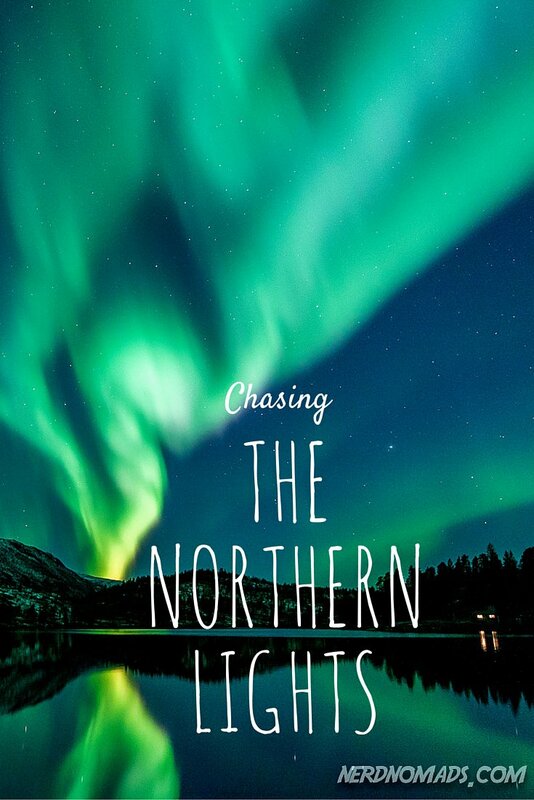 Good luck with chasing the Northern Lights! Once you see it, it is a once in a lifetime experience and something truly unique and memorable! 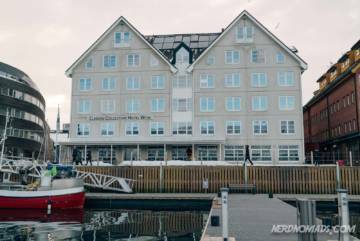 Hotel With, as it is known locally, has the perfect location right by Tromso Harbour with a beautiful view over the sea and over to the Arctic Cathedral, the Tromso Bridge, Tromsdalstinden mountain and Fjellheisen. You are right in the middle of everything if you choose to stay at this hotel, very close to all the city's restaurants and shops. 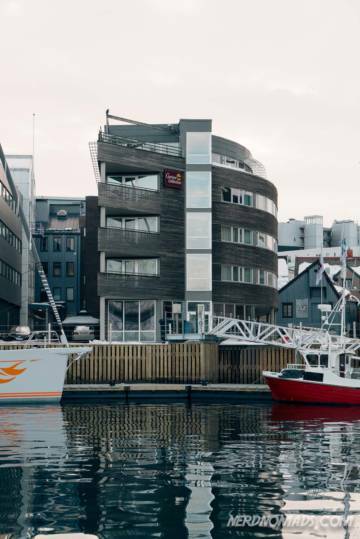 The new "star" when it comes to hotels in Tromso is, however, The Edge. It is brand new and has an excellent bar and restaurant which is also very popular among the locals in Tromso. You really should try the hamburger, it is great! The breakfast at The Edge is maybe the best in town with everything you can imagine. Located by the harbor, but further south than the hotels above, and close to the Tourist Information office. This apartment hotel has a central location on the street just above Tromso's main street Storgata. The apartments have a small kitchen, which is handy for making breakfast, lunch or even dinner inside. That way you can save some money by shopping at one of the close-by supermarkets and cook your own food. This is a budget hotel with perfect location in Grønnegata, the street adjacent to the city's main street Storgata. The hotel rooms are clean, new and fresh, but a bit small. If you are out all day on tours and sightseeing, then the small rooms will not be a problem. There is no daily housekeeping service. There is no restaurant in the hotel, but it is very close to all the restaurants and cafes that Tromso has to offer. You can get a breakfast discount of 50 % (150 KR) at their sister hotel Clarion Hotel, which is well worth the money as you can eat all you want at their excellent breakfast buffet. 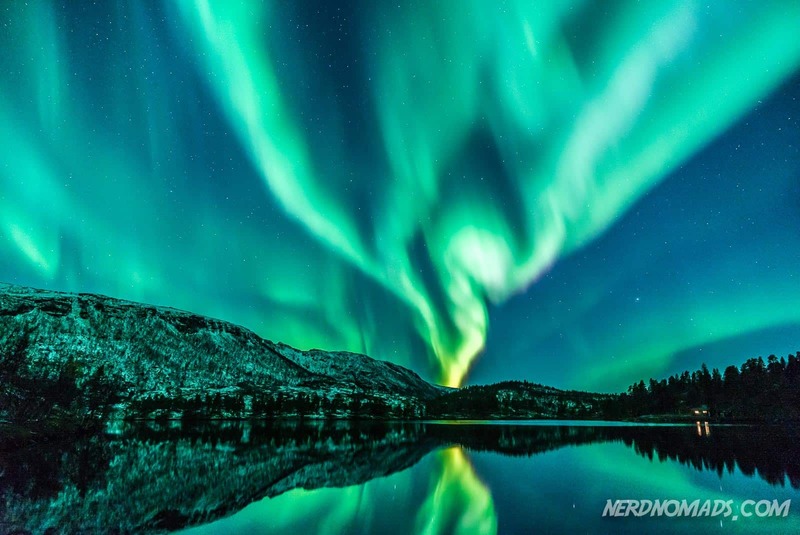 Have you seen Northern or Southern Lights, and if so where? If you have not, is this on your bucket list? Please leave a comment in the comment area below, thanks! What a superb article and great photos! We never see anything like that here in Southern California. Makes me want to head out to Norway and experience it for myself! Wow! I would love to see the Northern lights some day, but since I avoid winter destinations, it will never happen. Thanks for sharing these fabulous photos and information. I am so glad you got such an amazing night. I have been to Norway, but we enjoyed nearly 24 hours of daylight. Hehe, well you can visit in September/ October. We usually don`t have snow by that time yet, and the temperatures are not so bad. Still, it`s dark enough so that you can see the northern lights. Thank you so much! Tromso and it`s surrounding areas are awesome for Northern Lights watching and photography. So happy to hear that you saw the northern lights in Lofoten! It is such a great place, both summer and winter, we have been there several times. 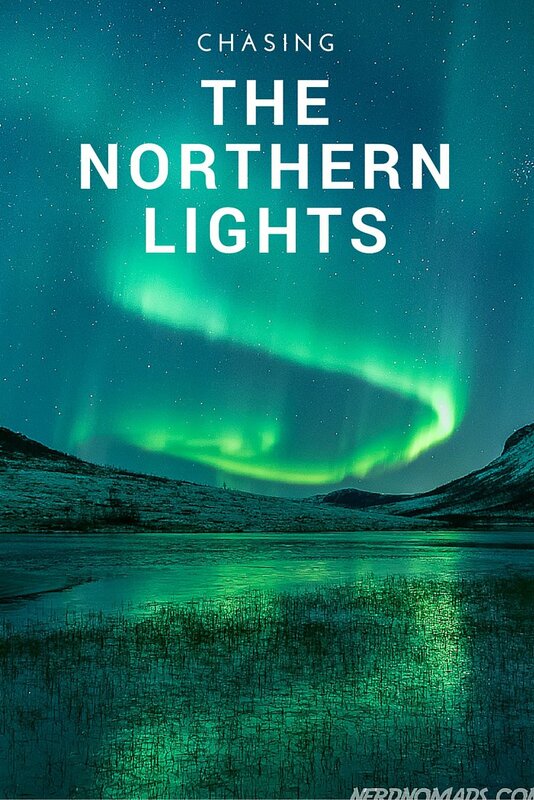 Hi Maria, I enjoyed your article on the Northern Lights! My husband and I used to live in Anchorage, AK and saw them frequently in the winter, usually just the green lights. Oddly enough, the only time we have seen red and pink was in Kentucky! It must have been a particularly good storm. I lived in Mandal, Norway many years ago. I didn’t see the Northern Lights there. It would be wonderful to visit your country again and go to Tromso! Thank you so much! So happy to hear that you liked my article! 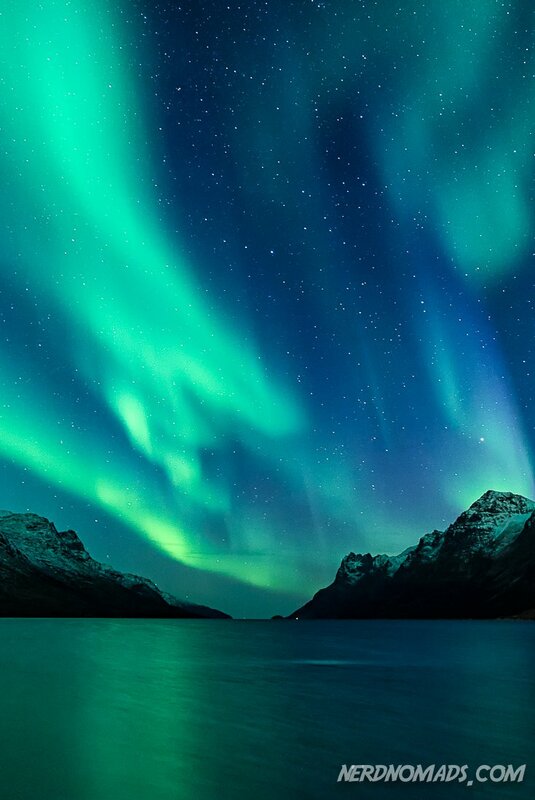 The green northern lights are most common here in Tromso too. Wow, it must have been a pretty huge solar storm when you were able to see red/pink northern lights in Kentucky! I love to watch the northern lights whatever color it is. Mandal is too far south of the northern lights oval. You are always welcome to visit Tromso! So cool that you lived in Mandal, and now live in Alaska. Would love to go to Alaska and go dog sledding! Thank you so much Fendi! Very helpful…..will be there this Tuesday ’til Friday next week so we’re crossing our fingers that one of those nights we’ll see Aurora Borealis……. Great to hear that you will be visiting Tromso this week as the weather is pretty good. Clear sky and good possibility of seeing the Northern Lights! Saw plenty last night. Crossing my fingers too! Have a great time in Tromso! Wow! Truly a magical place. I’m a bit jealous of you right now, you gets to see this all the time. 🙂 Anyway, it was great reading this post. I would love to see the Northern lights some day. Thank you so much! Seeing the northern lights is awesome, even for me who has grown up with it and see it every winter. I can never get enough of this light phenomenon. You should definitely come to Norway and see it with your own eyes. I HAVE to do this. This has to be one of the most amazing things to see in one’s lifetime. Also, Norwegian apple juice and strawberries should be massively exported everywhere. Sounds like you had a great time in the southern part of Norway! Hehe, yep I agree, Norway has the best strawberries, and they are even better and sweeter in the north of Norway since the sun is up all night long (midnight sun). You must try them! You can only see the northern lights when it is getting dark in the evenings, from September to April. From May to August the evenings are too bright due to the midnight sun, so you cannot see the northern lights. It is “less cold” in October, March, and April, but it can still be snow at least in the mountains surrounding Tromso. It is coldest during the dark period, 21st of November – 21st of January when the sun is completely gone and never comes over the horizon. Hope to see you in Tromso one day! Happy travels! Wow! If I ever get to see the Northern Lights, my life will be complete. Such amazing photographs. Hehe, yep seeing the Northern Lights is really breathtaking and something everyone should see at least once in their life. Thank you so much for your great comment! One of the biggest wish of my life to see northern lights. I wish i could see this in portarlington where i live, but its not possible. What are the best places in ireland to see northern lights? 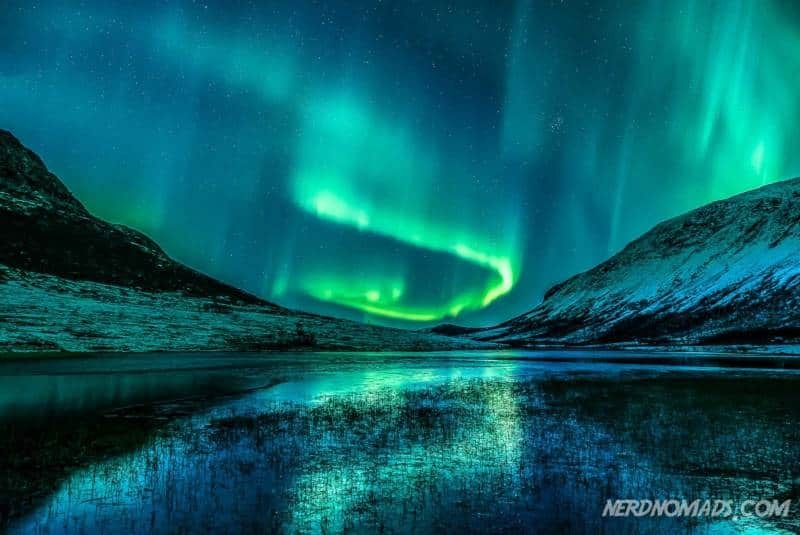 The best places in the world to see the Northern Lights are Northern Norway and Iceland as they are located right below the aurora. You can, however, see the Northern Lights in Ireland too as it is located between the 52nd and 55th latitudes. From Ireland, you get to see the edge of the Aurora Borealis. The most consistent regions are the most northern of Ireland. Crossing my fingers that you get to see the Northern Lights one day! It is a spectacular show! Thank you for the great content and all the detailed information about how the northern lights originate. Thanks a million for your nice words! 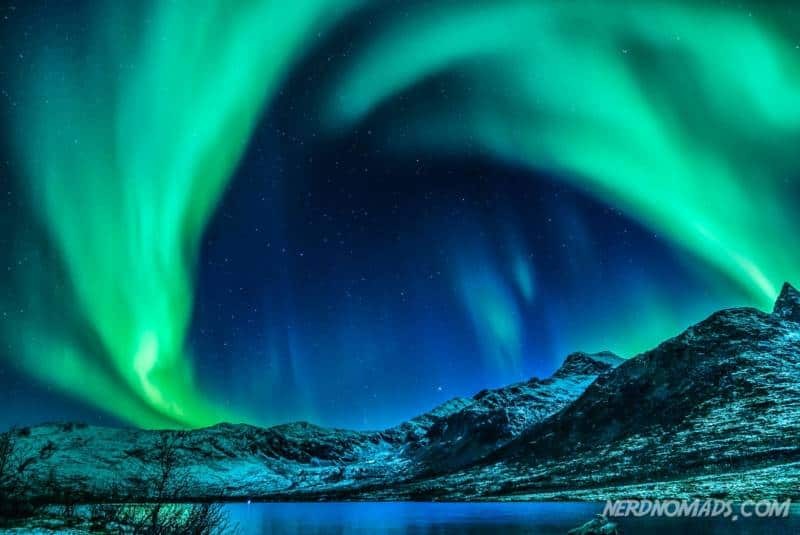 Awesome that you are heading to Tromso to see the Northern Lights! If the weather is nice with a clear sky, then it is easy to see the Northern Lights and you can see it from anywhere, even in the downtown of Tromso (if the Northern Lights are strong). But it is best to rent a car and drive a little bit out of the downtown of Tromso to escape the city lights. Kvaloya Island (meaning Whale Island) which is connected to downtown of Tromso by a bridge is an excellent area to see the Northern Lights. If the weather is bad, however, with cloudy weather, you can consider joining a Northern Lights tour. They really haunt the Northern Lights and will drive you around all night if that´s what it takes to see it, even to other parts of Northern Norway and to Northern Finland. They are skilled in reading the Northern Lights forecast and drive you to where the chances of seeing this natural phenomenon are best.